There are five different types of public bus systems in Costa Rica each with hundreds of routes operated by independent companies. InterCity Buses – operate between San José and other major cities around Costa Rica. For example Liberia, Nicoya, Santa Elena/Monteverde or Quepos/Manuel Antonio etc. Regional Buses – operate regionally for example between Liberia, LIR international Airport, and Playas del Coco or from Cañas to Tilarán, La Fortuna/Arenal, and San Carlos. City Buses – run within the San José downtown area and within some of the larger cities around Costa Rica. There are both normal and faster, more direct and more expensive mini-buses. Interlinea Buses – connect the suburbs in the Central Valley Metropolitan area to each other. The InterCity and Local routes are used to get around the country and you can find InterCity bus information here. The other three types of public bus lines serve San José, the airport and suburbs – How to connect and navigate the urban bus routes to get from point A to point B.
Navigating the tangle of public buses between, in and around the cities of the central valley of Costa Rica is difficult but a massive improvement over just couple of years ago. Historically all the bus routes radiated like spokes out from the center of San José because it was quite literally the only place 99% of the passengers were headed. If someone needed a lawyer, a specialty shop, a government office, corporate headquarters or a bank with more services than their branch it was in San José. Similarly if a central valley resident wanted to go on a long distance bus journey to the coast or an outlying city they had to get to the InterCity bus terminals downtown. 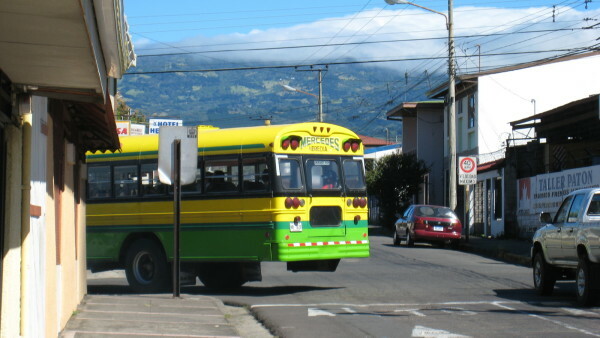 Public buses in Costa Rica are “public” mainly in name and are operated by over 100 private companies motivated by profits to serve the routes with the most potential passengers. As such when a new company started up they were likely to try to carve out their slice of the big pie and add another line to the profitable routes to and from the capital. This resulted in seven or eight competing companies serving the route from Heredia to San José and zero routes to the neighboring Escazú. The only option to get between these two cites was to take one bus from Heredia that would battle its way though congestion and traffic to the heart of San José then use a city bus or taxi to cross downtown to the Escazú terminal and take a third bus which would battle back out through the congestion and traffic to Escazú. The situation was similar from every city around the capital until the introduction in 2015 of Interlinea buses that don’t go downtown. Now it’s possible to skip the extra hour of traffic in and out of the center and just cut straight across…at least on the seven routes that have been added so far. More bus routes are being planned and the railroad tracks that fell into disrepair for decades are being used again as well. All of the interlinea routes are owned and operated by different private companies and there’s still no coherent central bus map or schedule but the public transit options around the Central Valley are improving. 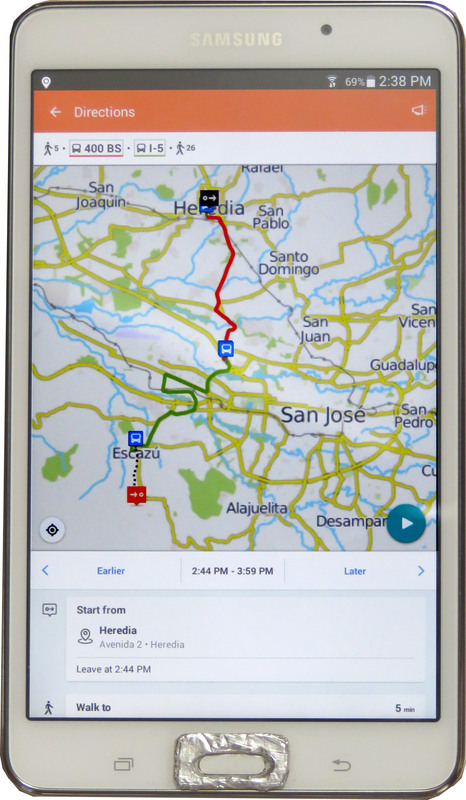 Much like Waze and other apps that compile updates from tens of thousands of drivers’ phones to create GPS maps and routing information for Costa Rica’s roads there is an app that tracks bus journeys. Moovit can be downloaded to a phone or tablet and provides schedules and routing suggestions based on what other riders have done. In mid 2016 I tested it for half a dozen trips that I’ve figured out in the past and it did okay. It seems to know all 7 of the currently operating Interlinea routes and most of the Central Valley Regional Buses from San José to other major cities in the Central Valley. It does well with downtown San José city buses but Moovit fails regularly on the last few km covered by outlying city buses. For example in the image above I was trying to get from downtown Heredia to the technical college in Escazú. Moovit found the regional bus from Heredia to San José and showed where to get off and change to the Interlinea to Escazú. However it says from there I had to walk the last 2.6 kilometers to the College even though I know from experience there’s an Escazú local city bus. Eventually as more people use the app it should learn about the missing routes. The tried and true method of just asking is probably still the most reliable. The most difficult aspect will probably be finding someone who regularly goes where you’re headed. Most people only know which bus to take to a few destinations that they visit regularly. Fortunately Josefinos and Ticos in general are wonderful helpful sorts and if they don’t know they probably have a cousin who does. Don’t be surprised if they get on the phone and call someone to find out for you! If you’re having a difficult time finding the right connections using the suggestions above then then it may not be worth the time an effort to figure it out. Unless you’re planning to travel the route dozens of times (commuting to a class or job etc.) you may be better off just catching a cab or maybe getting as close as you can by bus then getting in a taxi.